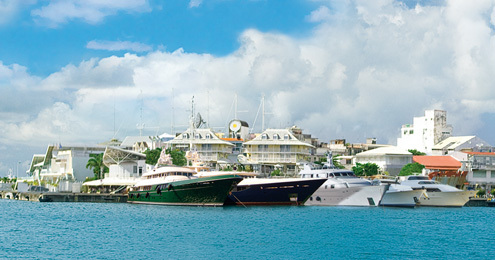 Amcon have been operating out of St.Maarten for many years, providing their highly recommended commercial diving and towing, haulage and dredging services to Superyachts and associated businesses throughout the Eastern Caribbean. Combining their extensive skills Amcon can also custom design, fabricate, deliver and assemble a private or commercial dock anywhere in the eastern Caribbean. This boatyard in St. Maarten operates a 50 ton travel lift, with many recommended service & repair companies working out of this busy boatyard. Located at Sandy Ground this useful small boatyard has a 135 ton crane, a 70 ton Travel Lift and two smaller lifts of 30 and 18 tons. The yard offers a wide range of services. Draft in the approaches is limited to 10’ max. Situated on airport road, this shipyard facility again came well recommended for its convenient location and for the full range of services offered to Superyachts undergoing refits. Smaller yachts and large catamarans up to 80ft can be hauled using their new 75 Ton KMI Sea Lift.